RadioPro provides remote access to Motorola MOTOTRBO and Kenwood NEXEDGE radios via IP Networks. 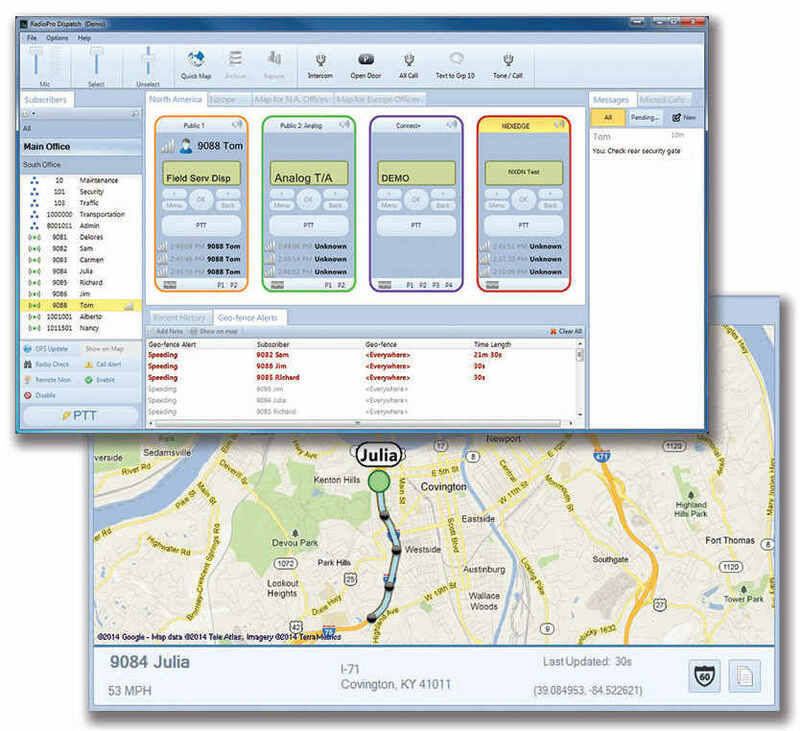 PC-based client software presents a user with either a console for dispatching simultaneous radio channels (RadioPro Dispatch), a low-cost user interface for PC users (RadioPro Talk), or a mobile app (RadioPro Mobile) that runs on iPhone/iPad and Android devices. As shown in the diagram, a system may have a mixture of Dispatch, Talk , and Mobile Clients. The IP Gateways interface the radio system to an IP network, ensuring easy wide-area deployment without purchasing and configuring server PCs. 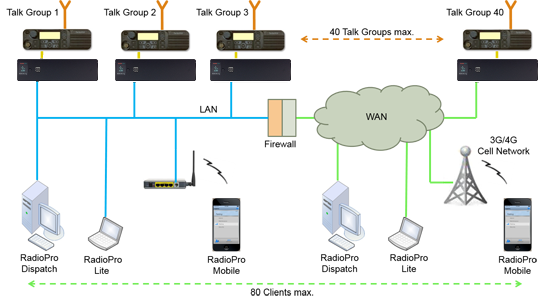 A control station radio and RadioPro IP Gateway for each simultaneous talk group. The RadioPro Dispatch client offers a console-type solution for applications requiring connection to many channels or talk groups. It is designed with an intuitive user interface to minimize learning time and maximize a user’s efficiency. 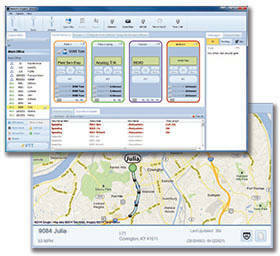 The IP Gateways and control station radios can be scattered among different locations, or centrally located. A host of accessories are available to implement an enterprise solution; including desk microphones, headsets, footswitches, and touch screens – all with PTT capabilities. Download the RadioPro Dispatch data sheet. 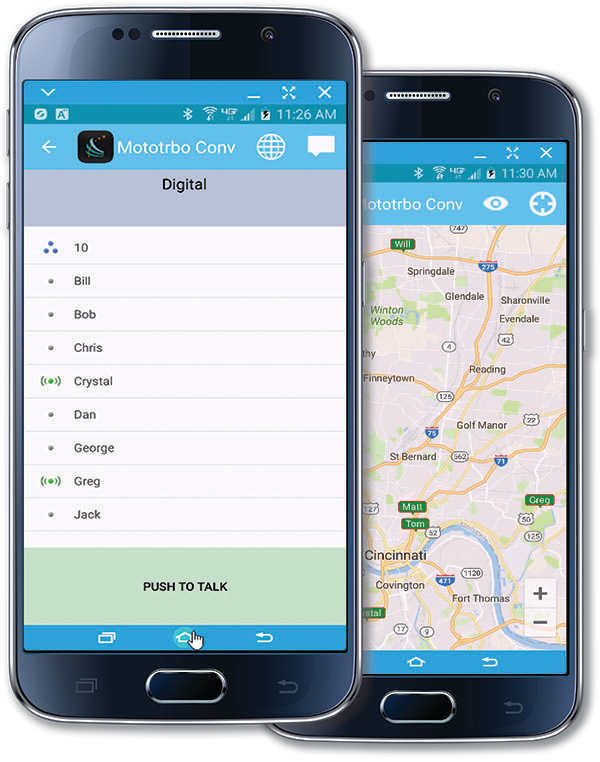 Talk to your radio system from anywhere in the world! RadioPro Mobile is useful over cellular networks when you are on-the-go and outside the coverage of your radio system, yet still need radio communications. It can also be used within a Wi-Fi network to lower monthly cellular charges. Download RadioPro Mobile for your mobile device from the Apple App Store or the Google Play Store; search for "radiopro". Download the RadioPro Talk for Mobile Devices data sheet. Simplicity that users expect. Functionality that administrators require. Download the RadioPro Talk data sheet. RadioPro Solo provides a virtual radio on your Windows desktop or notebook while focusing on simplicity for the user. 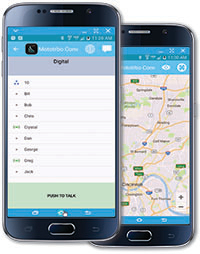 It allows remote access to Motorola MOTOTRBO radios via IP so that users can stay in "radio" contact. This is an economical solution in an office environment when using a radio is too expensive or involves too much additional hardware. Download the RadioPro Solo data sheet. The Interface between Radio and IP that makes sense! The RadioPro IP Gateway provides the hardware interface between a control station radio and an IP network. (Refer to the system diagram above.) In lieu of purchasing and configuring server PCs for this function, the RadioPro IP Gateway enables lower cost and quicker installation with the following features and benefits. This single, compact device requires no additional software or hardware installation by the installer. Configuration is made easy; therefore installation costs are kept to a minimum. The custom audio interface of the RadioPro IP Gateway is preset to give the highest quality audio. The guess-work for setting transmit and receive levels has been eliminated, and enables quick installation. Audio compression reduces the IP network bandwidth requirement to only 2.2kBytes/s per channel. Small size allows installation in limited spaces. No keyboard, monitor, or mouse is required. Just 8" x 3" x 12" deep, and less than 3 pounds, so that multiple RadioPro IP Gateways can be mounted on a standard 19" rack. Integrated Watch-dog circuit enables worry-free operation in remote, unattended facilities. Download the RadioPro IP Gateway data sheet.